MISSION — Dried fruit, leaves and seeds are things most people would brush off a dress. But Mary Virginia Gerlach actually goes out of her way to find them so she can put them on a dress. The painstaking time she spends making the garments is a habit she just can’t break. She’s tried. She’s reminded herself of the long hours it takes to design, glue and dye. She’s remembered how allergic the plants make her feel and the mess they make in her garage. And she’s remembered the embarrassing lengths to which she’s gone to get it all done — like the strange looks she gets while swiping spare onion skins from the grocery store. "It’s a passion — that’s all I can say," is how Gerlach explains her dedication to the craft. For 37 years, Gerlach has been one of the product costume show’s most devoted costume-makers, piecing together an average of three or four costumes each year for the contest, which celebrates the Rio Grande Valley’s citrus industry through elaborately themed costumes covered entirely in native product. The contest once garnered dozens of entries, but Gerlach and her decorating partner, daughter-in-law Cori Gerlach, are two of just a handful of designers who will exhibit costumes at today’s show. Citrus Director Berta Peña said Tuesday she expected about 10 costumes for the show’s five categories. Dwindling participation in the contest is unfortunate, Peña said, but it may be inevitable in a society where most women work and even teenagers have jam-packed schedules. "It’s a dying art," she said. "The kids don’t have time anymore, and neither do the moms." Gerlach, who works full time, agreed. 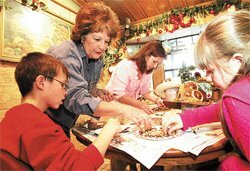 She fondly recalls the "garden club ladies" who made the fantastical, intricate costumes she remembers from her childhood and teenage years. But she also acknowledges the toll crafting costumes takes. Displaying her costumes at her Mission home Tuesday evening, she apologized profusely for the Christmas decorations that still decked the living room, and for the state of her garage, which was crowded with freezers to store dried product, half-finished costumes and containers of glitter, more dried product and glue. During Fiesta season, cars stay in the driveway Gerlach explained, sighing as she surveyed the jammed garage. But her eyes lit up as she held up the costumes-in-progress, which include a deep pink colored dress made of native red and purple bougainvillea, a T-shirt covered with dried avocado and flower and butterfly-shaped decorations made of pumpkin seeds and glitter. Cori Gerlach, for her part, confessed she had been sick lately and less involved in costume-making than she has been in recent years. But even when she’s trying to take it easy, she seems to have trouble resisting her hobby — she greeted her mother-in-law Tuesday evening with a special present: bougainvilleas from her yard. "Aren’t they beautiful?" she exclaimed, lamenting that it might be too late for her mother-in-law to use them, but saying she couldn’t resist picking them. Luckily for the Gerlach women, the rest of the family is filled with good sports about their obsession. Mary Virginia’s son, Brian, and husband, Ted, pitch in by chopping the product in the blender. And during fiesta season, Mary Virginia says Ted makes dinner. Even the smallest in the family get involved. Gerlach used to cajole her friends’ and neighbors’ children and grandchildren to model her costumes. "But then I got grandchildren," she explained. "So I had my built-in models." This year, all four are modeling — one in each division. Their grandmother, in typical doting fashion, has costumes to fit them to a tee.